URBED worked alongside landscape architects Landscape Projects and planners and engineers at Cundall to bring forward a scheme at Seaburn to transform the seafront area. There was a time, as remembered by members of our team when Seaburn was a thriving resort with a permanent fairground, dominated by a big dipper, amusement arcades, restaurants, promenade, deck chairs and donkey rides. However along with many UK resorts it’s popularity has declined particularly as a destination for family holidays. The funfair has closed (although the site is still used for travelling fairs) and only a few restaurants and amusement arcades remain. The question that we need to address in developing the Seaburn site is the nature of a 21st century seaside resort. Where as in the past this catered for family holidays, today it is more likely to be day trips. Whereas before the main audience were visitors, today it is also likely to be people seeking somewhere to live, either to commute into one of the nearby centres or on their retirement as part of Sunderland’s aspiration to be “the UK’s most liveable city”. 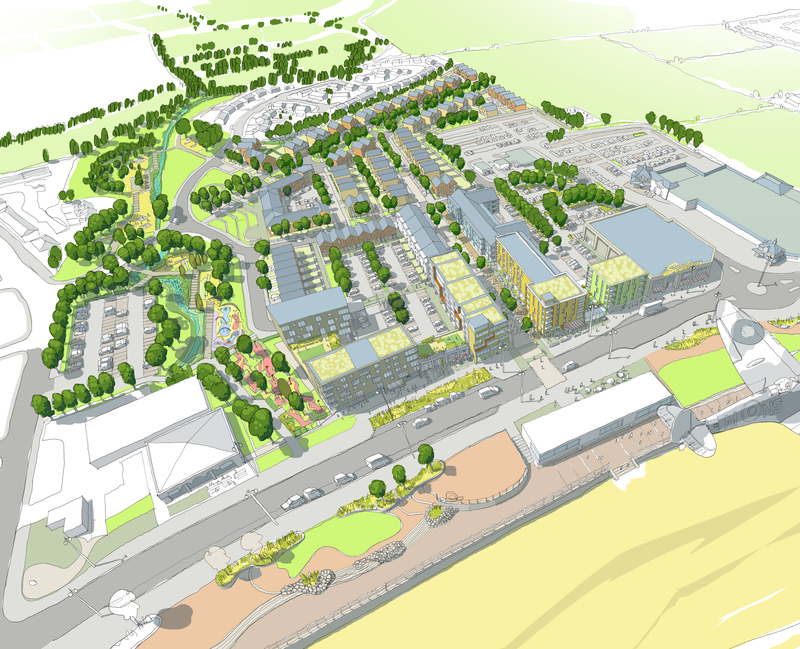 Proposals were brought forward to improve Seaburn’s standing as a seaside destination and great place to live, with new leisure space, cafes and restaurants on the seafront, alongside new apartments and houses. We would like to share the outputs of two surveys linked to the planned redevelopment of the Seaburn site. The first is a report from the Royal Institute of British Architects (RIBA) and reports on independent experts’ views of the vision Siglion has for the area. The other report captures feedback from local residents from March 2016, following our second public consultation at the Seaburn Centre. All of the feedback we have received is shaping our plans for Seaburn, and we have already appointed a specialist retail and leisure agent – Ian Thurlbeck from @retail – to begin the process of marketing the 100,000 sq ft of leisure space the site will include. To reconfirm that this is only the beginning of the development process and not the end and that ‘the window of opportunity’ to meet and put forward ideas does not close with the submission of the planning application. We would very much like to meet individuals who want to understand more about the process. Please contact Katie Sully of Siglion at katie.sully@siglion.co.uk if you would like to meet and discuss the development further. If you can't make it along at the times above you can still provide feedback. The boards displayed at the public exhibition are available to download and view below, along with several technical notes on transport, the planning context and drainage. Please also take a look at this video which explores Seaburn's history and sets out the vision for the future of Seaburn. We would like to thank everyone who came down to view the initial masterplan proposals at the Seaburn Centre last month. We had a huge level of responses, which demonstrates how important Seaburn is to the people of Sunderland. We are keen to continue the discussion with local people to try and alleviate the communities concerns and adjust the masterplan where possible. We will be holding a further exhibition in early 2016 once the masterplan has progressed and we will advise you of the dates of this exhibition in due course. Once you have had a look through, we would really appreciate your feedback and comments on the proposals, so please fill out our online survey form here. Seaburn October Exhibition: Tell Us What You Think! You can drop in anytime between the times shown below and members of the team will be on hand to take you through the proposals and answer any questions. Questionnaires will be available on the day for you to leave any thoughts, comments and feedback you may have. There was a general agreement that the site should be family-friendly, and especially not become the new “drinking centre” for youngsters. Most groups mentioned the importance of having a mixture of uses including some housing and prefer leisure, retail or holiday let. All groups were keen for the masterplan to include increased leisure uses on the site to encourage more families to visit and stay longer. All-year leisure uses was sited as important to ensure the area is not just used for the summer holidays. Most groups mentioned an aspiration to provide popular amenities, like an ice rink or swimming pool, as well as annual or monthly events like live music or food festivals. Seaburn is a place with character. All of the groups mentioned Cut Throat Dene, as a key site in the identity of Seaburn and the future layout should be considered carefully. The high quality and beauty of the development is a concern, about housing as well as about public space which should be attractive but still allow everyone to feel welcome and comfortable, as suggested in the “Mix of people” section. Details such as enough places to sit and having public toilets available are also important to the overall success of the scheme. There was apprehension from all groups that the new development will increase traffic and parking issues. Generally they felt that there should be more parking provided as part of the development. Interest has been shown in the way public transportation could be a solution for the traffic issues. Better way-finding and links to the local METRO station would help encourage the use of public transport and may also reduce the number of parking places needed.